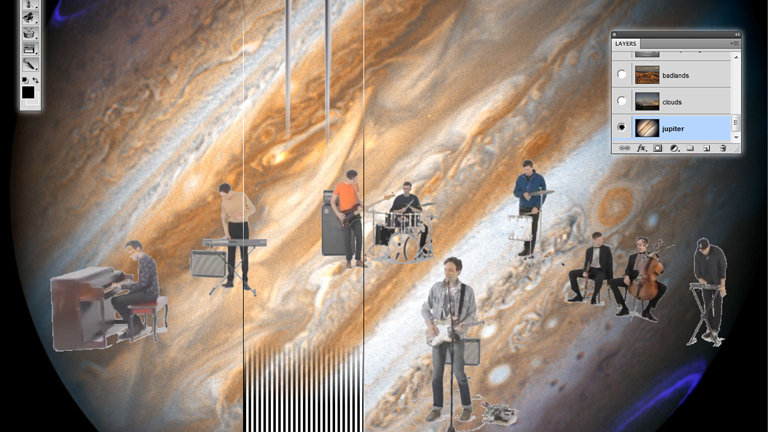 Tanlines are back with a new interactive music video created by the ever surprising design agency OKFocus. Experimenting with an alpha-channel video based on the band’s own promo for the “Not The Same” track, the interactive version is set in a Photoshop replicating environment. The left side replica of the Tool Bar allows users to disable a certain instrument from both the visual and audio spectra. The Layer’s box facilitates several background options including images from Dump.fm, user generated Instagram pics tagged #notthesame, a live feed from a FishCam or even moving images from Williamsburg Bridge. On top of it all, you can also rearrange the position of the band members with a simple click-drag-and-drop! And if you’re really into secret goodies, why don’t you try clicking on the work “experiment” under the title? Hint: It works best when mixing it with the Tool Bar options! Tanlines are back with a new interactive music video created by the ever surprising design agency OKFocus. Experimenting with an alpha-channel video based on the band’s own promo for the “Not The Same” track, the interactive version is set in a Photoshop replicating environment. The left side replica of the Tool Bar allows users to disable a certain instrument from both the visual and audio spectra. The Layer’s box facilitates several background options including images from Dump.fm, user generated Instagram pics tagged #notthesame, a live feed from a FishCam or even moving images from Williamsburg Bridge. On top of it all, you can also rearrange the position of the band members with a simple click-drag-and-drop! And if you’re really into secret goodies, why don’t you try clicking on the work “experiment” under the title? Hint: It works best when mixing it with the Tool Bar options!